An Iban boy of 3-year and 8-month old presented in October, 2005 with a six-month history of progressive left proptosis (Figure 1). There was no family history. 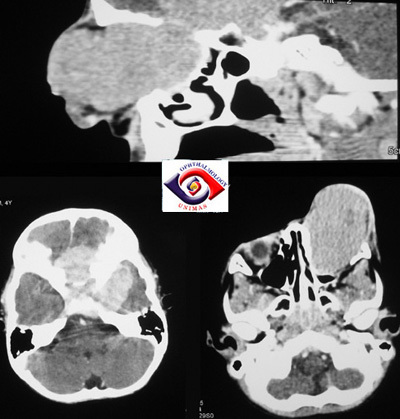 An urgent CT scan revealed an infiltrative tumour involving the whole globe and orbit with optic nerve and intracranial extension (Figure 2). An orbital biopsy was performed to differentiate between two main possible diagnosis: retinoblastoma versus rhabdomyosarcoma. The histologic report showed features of retinoblastoma and the patient was started on chemotherapy. The family was informed of the poor prognosis and further surgical treatment was not thought necessary. Figure 1. Left massive proptosis. globe and orbit with extension into the anterior and middle cranial fossa. He received a full course of chemotherapy for retinoblastoma. He also underwent orbital radiotherapy to eliminate any remaining tumours. When seen in February, 2006, the proptosis showed remarkable resolution (Figure 3). Repeated CT scans revealed shrinkage of the ocular and orbital tumours as well as disappearance of the intracranial lesion. Figure 3. Left enophthalmos due to significant shrinkage of the tumour. Figure 4. Remarkable shrinkage of the orbital lesion and disappearance of the intracranial lesions. a. What is the survival rate of retinoblastoma? b. How would you manage this case?